This topic explains conceptually the kinds of chart series that can be produced with the igDataChart™ control. This topic provides conceptual information about the igDataChart control including its main features, minimum requirements for using charts and user functionality. The igDataChart control allows for a variety of series types to be implemented for different visualization purposes. See the next block for detailed information on supported series types and basic configuration information. Note: Pie charts can be created using the separate igPieChart control. For details see igPieChart Overview. Bar and column charts visualize data with the help of filled rectangles where the larger size corresponds to the visualized value. Technically, bar and column charts mean one and the same but we make a distinction that bar charts have bars span horizontally and column charts have bars span vertically. Bar charts are used to display data of separate functions for a discrete category axis values. For example the figure below shows a bar chart with the volume of car sales from three manufacturers (separate functions, i.e. 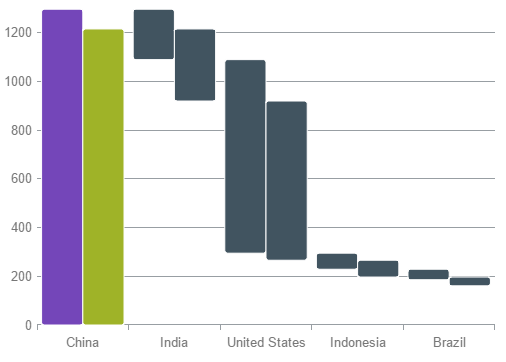 single manufacturer sales as a function of region) for different geographical regions (discrete category axis values). Bubble charts represent data entities with four independent numeric parameters in the form of (typically) filled circles. The coordinates of the center of each circle represent the common x- and y-coordinate parameters of each entity. The radius of the bubble represents the third parameter. Part of the bubbles can be filled with different color to represent a possible fourth parameter of the data series. The fourth parameter is not mandatory and if skipped all bubbles will be depicted with the same color. There is also an additional fifth parameter that can be used as a label for each data point. 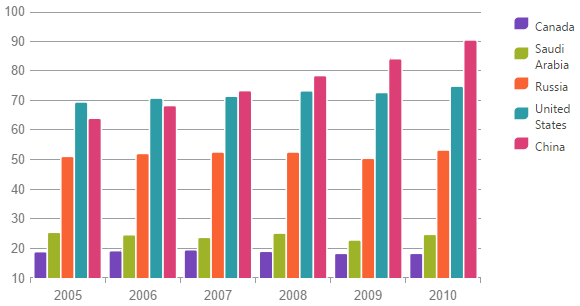 Category series charts are a range of series types for the igDataChart control that allow data for separate distinct category axis values to be plotted. This various types are: area, column, line, spline, spline area, step area, step line and waterfall. For more details you can investigate the topic dedicated on category series charts. Following is an example of a waterfall chart. Financial charts (also called candlestick charts) are a variation of bar charts which allows for more variables to be depicted. They are mainly used to visualize stock market movements of a particular commodity, currency or stock representing opening, closing, minimum and maximum price for a particular period. Each “candlestick” stands for a specific time period (for example, a day), the lowest point of the candlestick is the lowest price, the highest point is the highest price, and the lower and higher end of the bar are the closing and opening prices, correspondingly. 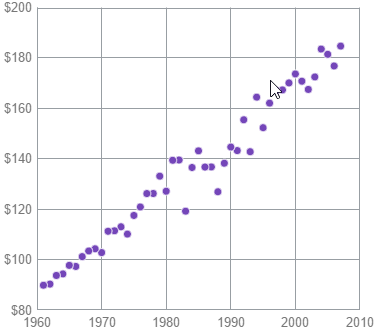 Usually these charts are combined with trend lines which are derived by using some mathematical function applied on the data series to calculate approximation and extrapolation of the data. For example, average, quadratic, or logarithmic functions. 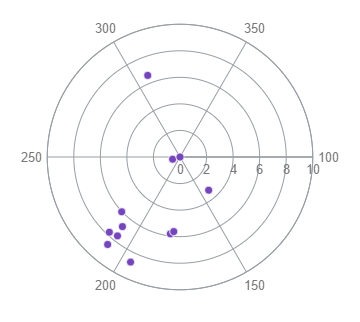 Polar scatter charts are plotted in polar coordinate system where the first coordinate is expressed in angle units (degrees, radians) and the second as distance from center (radius). The chart shows discrete points which are not connected and is useful to assess the “density” of the points (for example, measurement samples) in a certain area on the chart. It is also possible to plot polar line or area depending on the purpose. 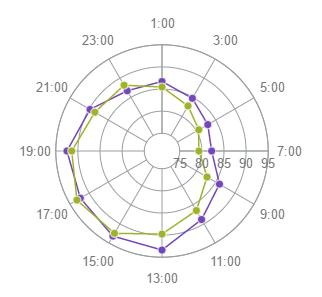 Radial line charts are similar to polar scatter charts but it is a category type series, i.e. it lacks angle coordinate and instead data is divided into categories that are spread evenly across a full circle. The distance from the center depicts the visualized value. It is usually used to visualize small datasets and to compare quantitatively between multiple aspects of one object. For example, it is used for player statistics in sports regarding different aspects like agility, speed, effectiveness, etc. Range category charts are used to depict the spread between two values that fall in a certain category. 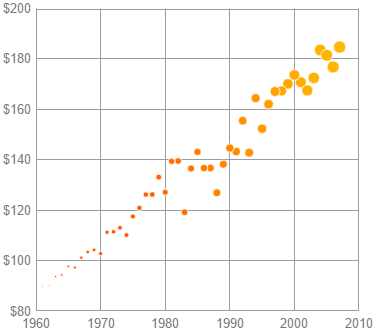 The variables used to plot the chart are the category coordinate, and two values in the same measurement unit for the category. This chart was invented by stock market traders and used primarily in that industry. 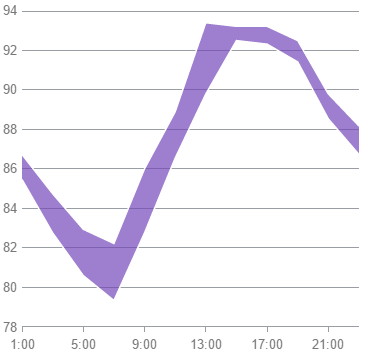 The specific feature is that these charts are not time based but rather movement based, i.e. two different values on the category (x) axis represent two different movements and the change between deals can be tracked. Using igDataChart you can implement range area and range column charts, and the sample chart above is a range area chart. Scatter charts depict individual points in orthogonal (Cartesian) coordinate system, and is sometimes also called XY-chart. It is possible to plot only discrete points or points connected with lines. Scatter charts are used to represent scientific measurement or other data collection for the relation of two variables and easily shows the density of samples in particular area of the measurement, and it is possible to spot trends in the distribution of data. Two of the scatter types, scatterPolygon and scatterPolyline, depict data differently than the other types. They depict collections of points as two-dimensional shapes where each point makes up one corner, or vertex, of the shape. For example, a rectangle is produced by having 4 points, one in each corner. The scatterPolygon type depicts a filled shape while the scatterPolyline type depicts the point collection as line segments connecting each point. 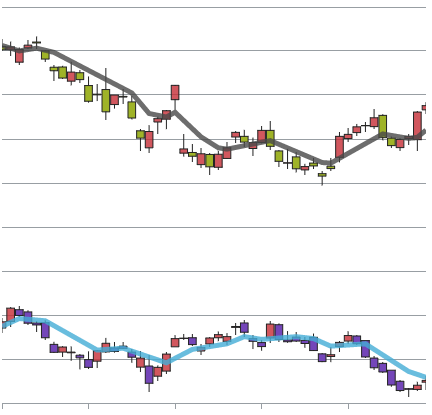 This sample demonstrates how to configure a composite chart with two Y-axes with different range and two different data series types: column and line series. There are no specific settings for creating composite charts but rather you can mix different series types and use multiple axes. Adding igDataChart: This topic demonstrates how to add the igDataChart control to a web page and bind it to data. Bar and Column Series: This sample demonstrates creating bar and column series charts. Category Series: This sample demonstrates creating category series charts. Composite Chart: This sample demonstrates creating a composite chart. Financial Series: This sample demonstrates creating financial (or “candlestick”) charts. 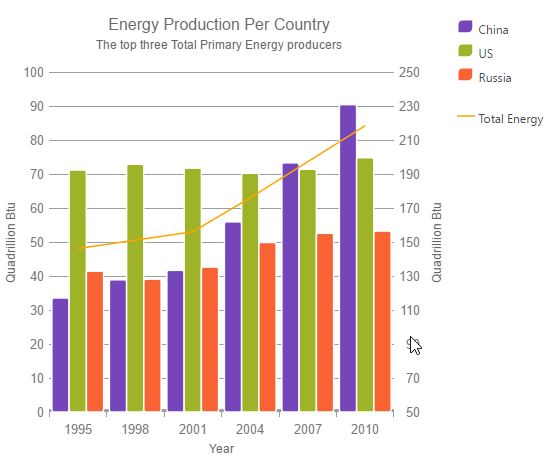 Polar Series: This sample demonstrates creating polar charts. Radial Series: This sample demonstrates creating radial charts. Range Category Series: This sample demonstrates creating range category charts. Scatter Series: This sample demonstrates creating scatter (or “XY series) charts. 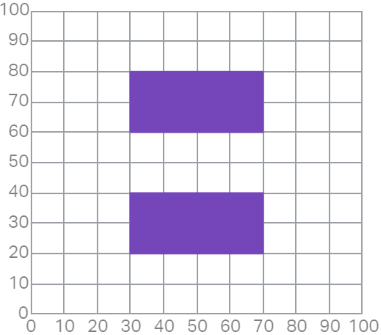 Stacked Series: This sample demonstrates creating Stacked series charts (XY charts).